Last week we discovered a pool of ‘green blood’ under the car…Is it an Alien’s? As we learned in Coolant System Part 1, that "green stuff" is not some weird alien blood (although to some, a car may seem like an alien)! It is anti-freeze – also known as coolant. What does Coolant do? Coolant performs a number of important roles in keeping your vehicle on the road. Its primary function is to cool engine parts around the cylinder walls and cylinder head where your car’s fuel is burned; that is, where combustion takes place. The engine needs coolant circulating through it continually; without it, the combustion chambers reaches temperatures over 2,500 degrees Fahrenheit (RED HOT, in other words). Its secondary responsibilities are to heat the inside of your car (via the heater) and to keep corrosion from forming in the radiator, engine, and heater core. As coolant (designed to not boil until it reaches 250 degrees Fahrenheit) circulates through the engine, it carries heat away from the cylinder walls / combustion chambers to the radiator. The anti-freeze cools down as it flows through the radiator. It then repeats its cycle of flow - back to the cylinder walls, picking up the heat to expel once again to the radiator. 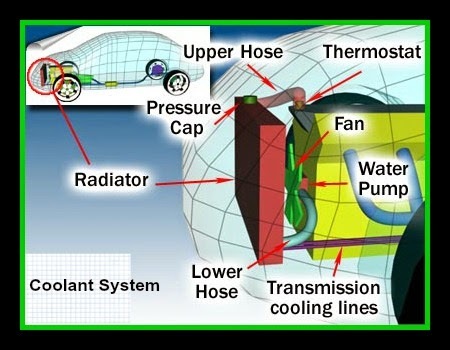 The thermostat is what regulates the coolant temperature by controlling how fast and where the coolant goes, maintaining the cooling system's proper temperatures at a cool 190-200 degrees. Needless to say, the cooling system needs to be kept in good working order: coolant performs essential roles in keeping your vehicle on the road and comfortable (warm and toasty). Proper maintenance is required. Water Star Motors recommends that you repair all leaks immediately, take care of your water pump, and REPLACE COOLANT every 2-3 years. (As exotic as it is, and although some coolant is advertised as lasting for up to ten years, coolant has a relatively short life span; experience tells me that 5 years is max and 2-3 years is best.) A good, professional "Coolant System Flush" – replacing the entire contents of the cooling system – is a great investment for your car’s health. In closing: We highly recommend regular ‘green blood’ transfusions for your 'Alien' – that is, regular cooling system maintenance – to promote long life and happiness. And no, even though it may bleed ‘green blood’, your car really is not an Alien; you can think of it as just having a preference for green ‘cool-aide’.